KOOTENAY REPORTS DRILLING INTERSECT | Kootenay Silver Inc.
Kootenay Silver Inc. (TSXV: KTN) (the “Company” or “Kootenay”) is pleased to report that Aztec Minerals Corp. (TSXV: AZT) (“Aztec Minerals”) today announced the first five of 15 drill holes from its phase I, 3,000 drill program, currently underway at Kootenay’s Cervantes Project, located in Sonora State, Mexico.Drilling conducted by Aztec Minerals successfully intersected long intervals of porphyry gold, copper and silver mineralization including shorter intervals of high grade gold mineralization within the California Zone confirming excellent potential to host bulk tonnage porphyry mineralization. To view a map of the drill area click on the following link: Cervantes Drill Plan. 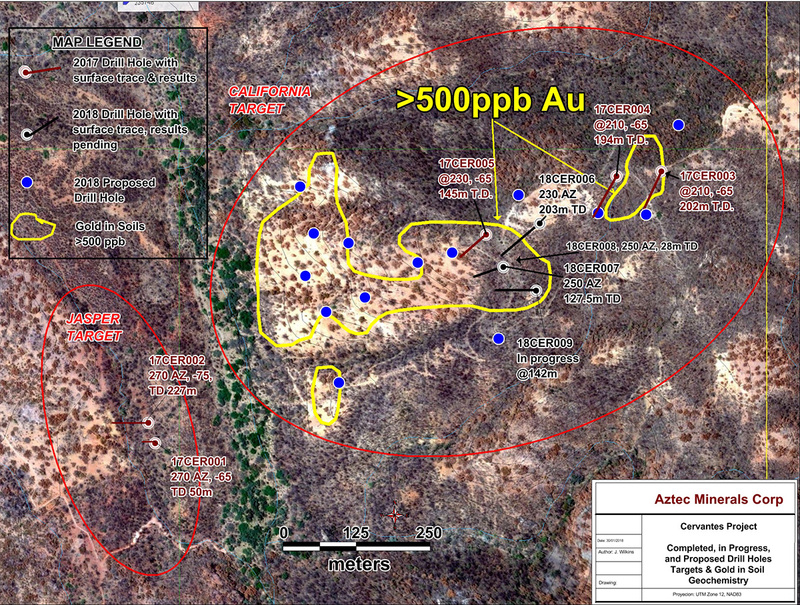 The Cervantes Property is held under an earn-in option to agreement whereby Aztec Minerals can acquire up to 100% interest in the property in two stages. Upon completion of the two stage earn-in, Kootenay will retain a 2.5 % NSR and receive a payment of US$5.00 per ounce or gold or gold equivalent based on a NI 43-101 Resource Estimate. For more information see the Company’s news release dated October 13, 2015. Note: True widths cannot be accurately determined from the information available at this time therefore core lengths are reported. All core samples were split in half, placed into plastic bags, labeled with sample number, closed with zip ties, and placed in rice sacks by Aztec Minerals. Samples were typically collected in 2.0m intervals with occasional exceptions of 1.5 or 3.0m intervals. Blanks, duplicates, and certified standards were inserted into the sample stream and subsequently reviewed without any outliers or abnormal results. The samples were delivered to Bureau Veritas Laboratories in Hermosillo and analyzed for gold using a 30gram sample by fire assay fusion with AAS finish. Samples were shipped to Vancouver and analyzed with a 0.25gram sample using 4-acid ICP-MS providing analysis on 45 elements. The Kootenay technical information in this news release has been prepared in accordance with the Canadian regulatory requirements set out in National Instrument 43-101 (Standards of Disclosure for Mineral Projects) and reviewed on behalf of Kootenay by James McDonald, P.Geo, President, CEO & Director for Kootenay. The information in this news release has been prepared as at January 31, 2018. Certain statements in this news release, referred to herein as "forward-looking statements", constitute "forward-looking statements" under the provisions of Canadian provincial securities laws. These statements can be identified by the use of words such as "expected", "may", "will" or similar terms.